Think – instant conversation starters! Group size: 10+; great for really large groups. 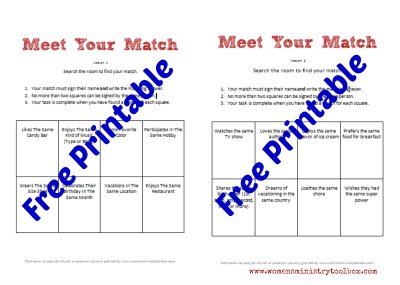 Supplies: One “Meet Your Match” game board per person; pen/pencil per person. Instructions: Explain to the group that the goal of this game is to uncover matching interests and experiences with others in the room. When you feel most people have finished call the game to an end. If time allows you could ask a few people to share one of their matches. Winner: There is no “winner” or prizes handed out for this game. Notes: Ideally, everyone is a winner because they’ve made a new connection. There is no set time limit or stopping when the first one is finished because you want everyone to connect as much as possible. Encourage them to make as many unique matches as possible. You could even ask if anyone has 8 unique matches. 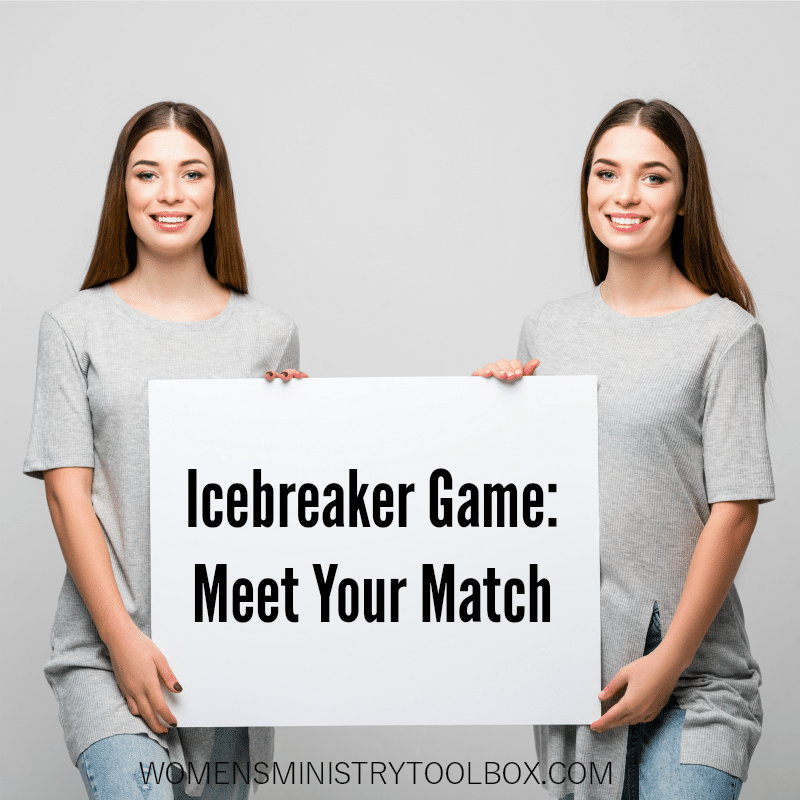 If time allows, have a few people share one of their matches and ask others with the same answer to stand up too – revealing more common connections with those in the room. May God reveal new connections amongst your women! Please let us know if you play it and how it goes! Marie, I am so sorry! They are all PDF files. Do you have software installed that will allow you to open a PDF? Often times it’s a browser issue. Try switching browsers and see if that doesn’t work. If you’re still having problems let me know. Jane – so glad both games worked well for you! 🙂 Thanks so much for sharing your success! Worked great at our Church Ladies Party. We also did the pass the present game at our event. They were both really fun.